Good morning! Today I have what I consider to be a nail fail. I wanted to have another go at making stamping decals. Previously I had tried the method where you let the decal dry on the stamper, the disadvantage of course being that you can only make one at a time (unless you have multiple stampers, I guess). 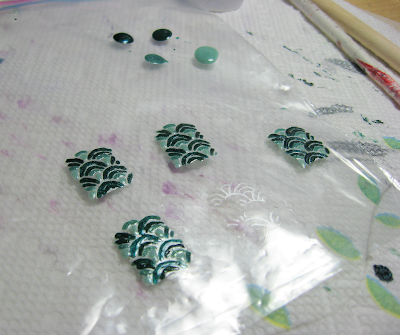 This time I made them on a plastic baggie, starting by putting down some splotches of topcoat and letting them dry, then stamping on top of that. I used a stamp from Winstonia W111, which is a cool sort of art-deco pattern. I stamped with my go-to silver, Julep Harley. 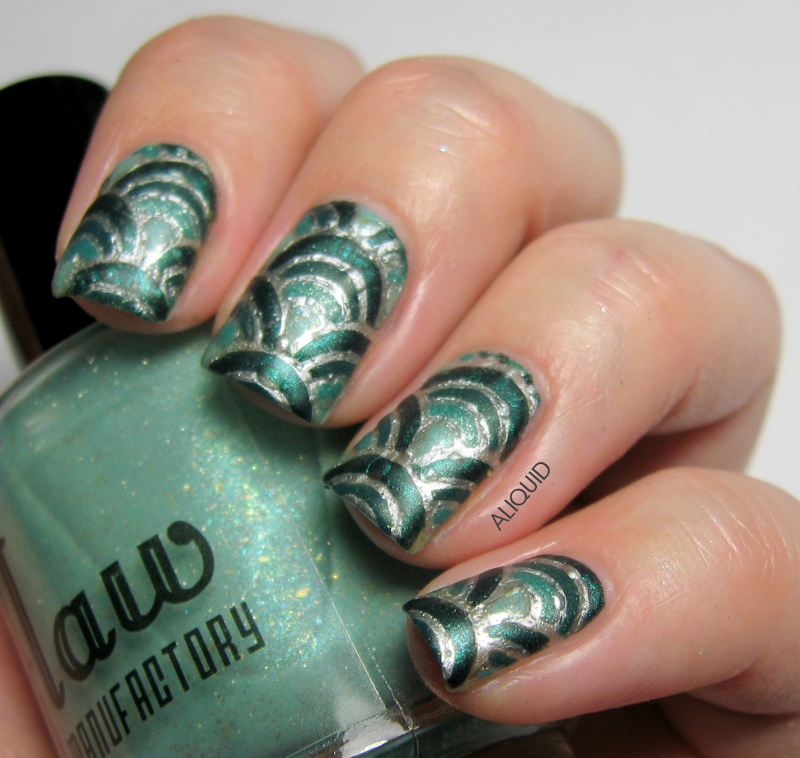 Then I decided to fill in the little arches with various shades of sparkly teal: Sally Hansen Jet Set Jade, Julep Valerie, Zoya Zuza and Scofflaw Wraith Pinned to the Mist (I really must swatch this one alone sometime). I put on a matte topcoat to try to obscure some of the imperfections, but they are still glaringly obvious to me. I can't help being a perfectionist, I guess. If someone out there has mastered the art of stamping decals, please share your secrets!! Good morning! 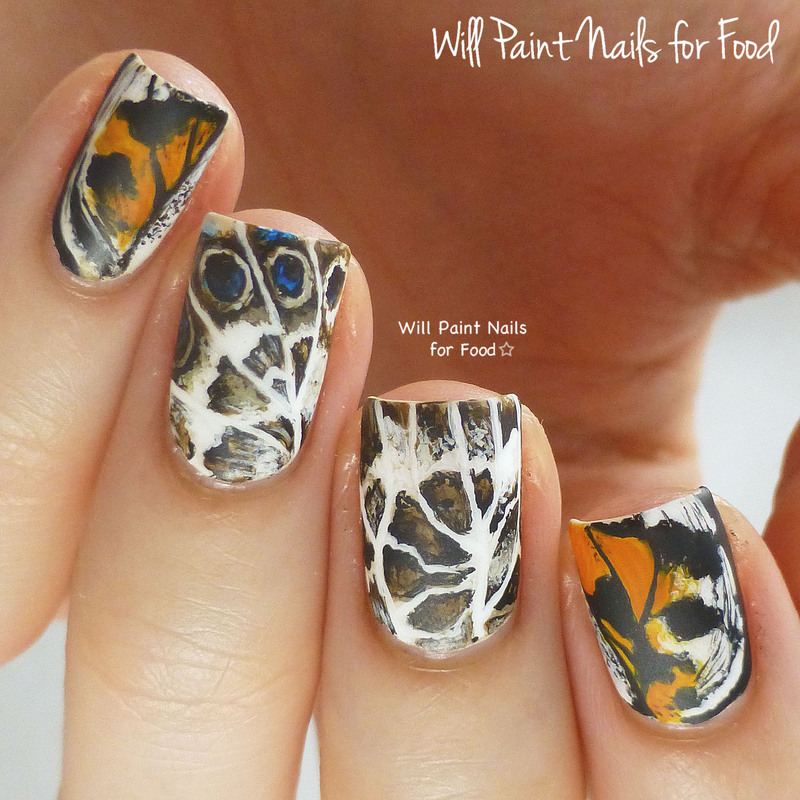 As promised, I have my favorite nail art from October for you today! 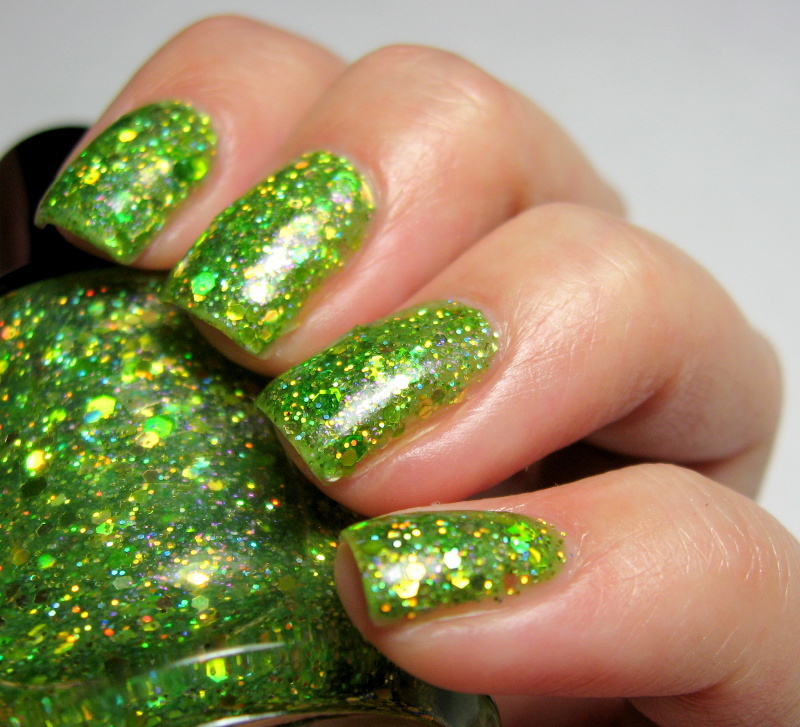 Naturally my blog feed was full of Halloween manis last month. I'm not always a fan of holiday-themed art, especially if it's cutesy, but I did find a few gems! 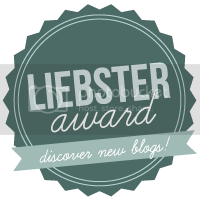 Don't forget to check out the original blog posts and give props! Narmai did a lot of amazing Halloween art, so it was hard to choose, but I think this one is just over-the-top awesome. Plus the six-pack is great. And her painting skills are ace as usual. It's not Halloween, but it IS beautiful. 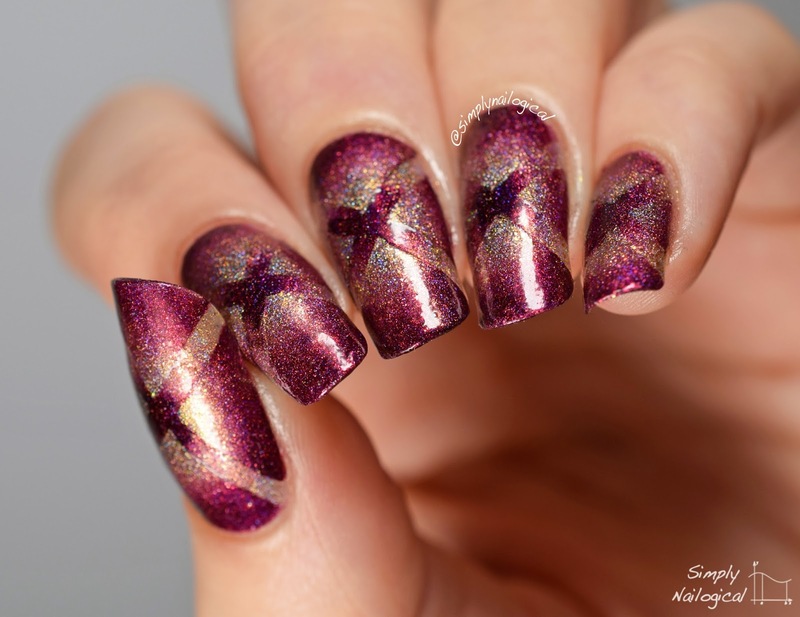 This is a more refined version of the butterfly mani you see everywhere (and which I've done before). 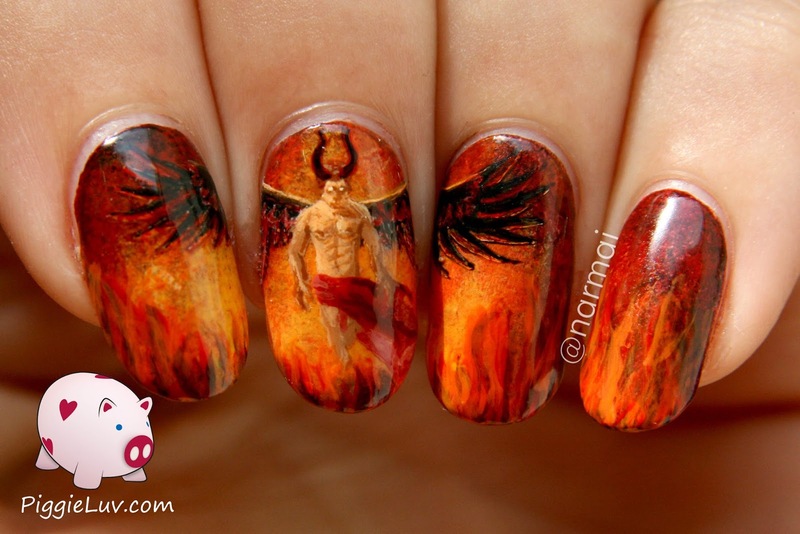 When I first saw this mani, I was shocked how realistic it looks. I love that Meghan took inspiration from actual photos of butterfly wings. 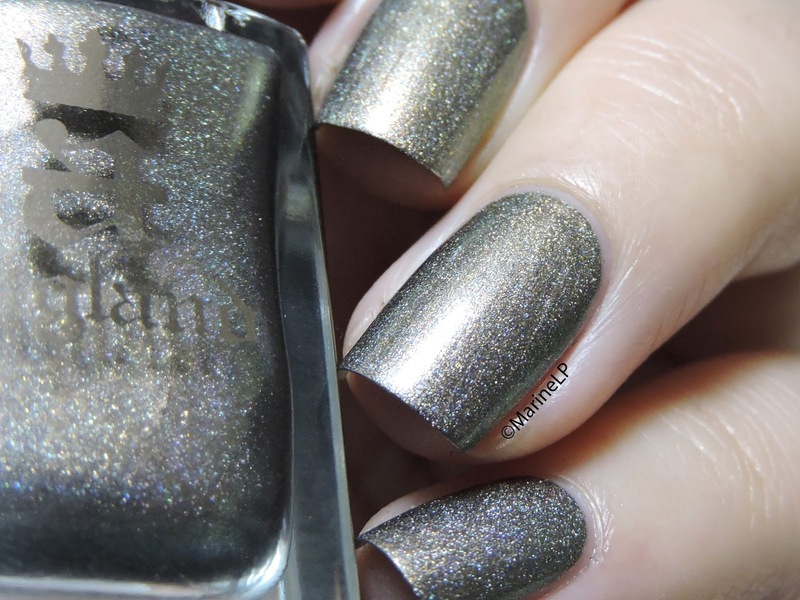 This mani is so outside-the-box, I just love it. 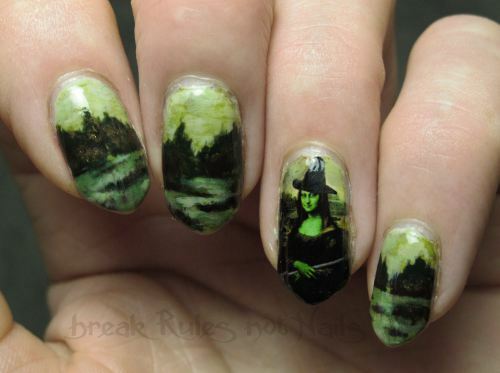 Who would think to put the Mona Lisa in a Halloween mani? She made a water decal for Mona Lisa herself and painted the rest by hand--I love how creepy the landscape looks. I love it when people take gradients to the next level (it's something I'd like to work on). This one almost feels like an optical illusion. And the holo just makes everything cooler! 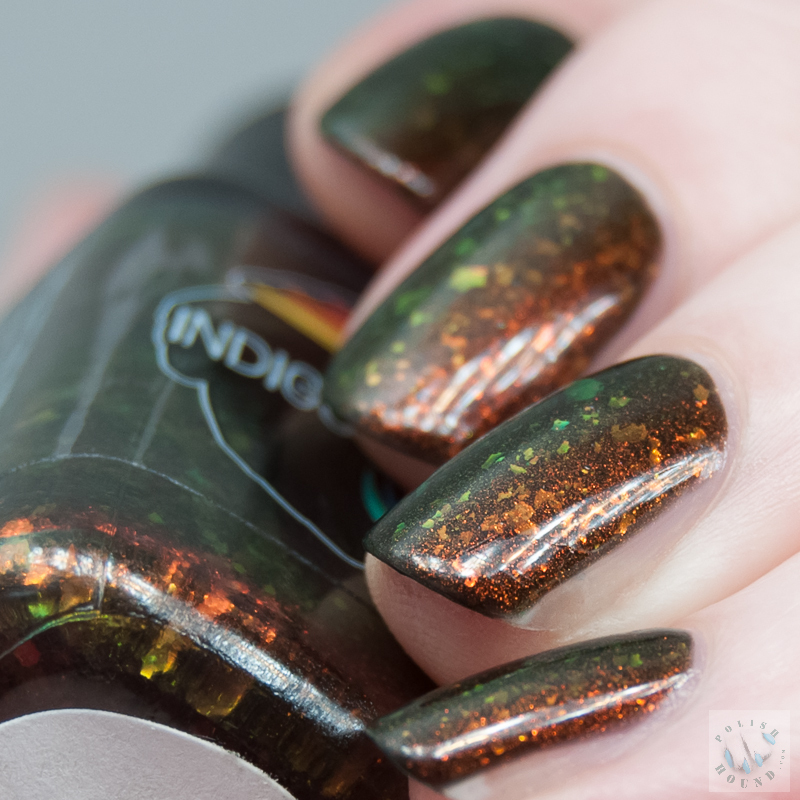 This is a great understated Halloween mani in my opinion. Not overly cute or gory. 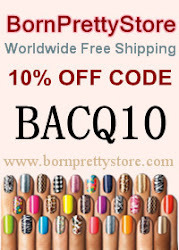 I always love dotticures, and I also like the variety of shades of orange she used here. I might have to borrow this idea next year! That's all for today! I hope my fellow Americans voted yesterday! Hi all! Sorry for the radio silence the past few days--my in-laws were visiting for the weekend, then yesterday was Mr. ALIQUID's birthday! Being the boring people we are, we celebrated by getting Chinese food and visiting a new grocery store that just opened here. Thrilling! 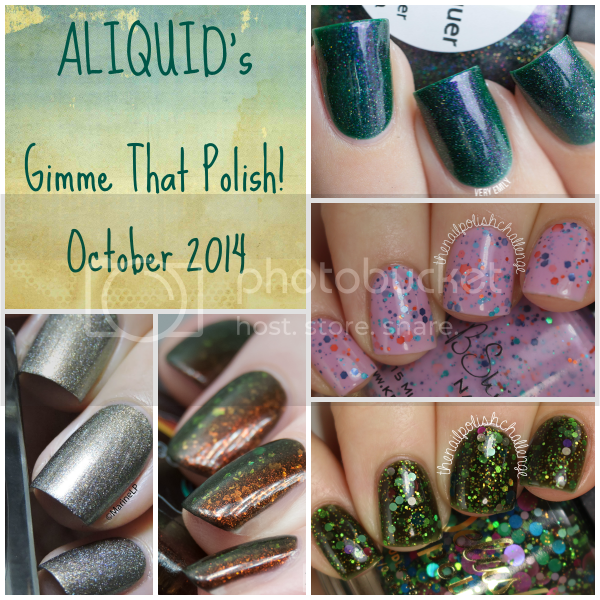 Anyway, here finally are my top five lemmings from my Pinterest wishlist for October! Lots of beautiful fall and winter shades here. 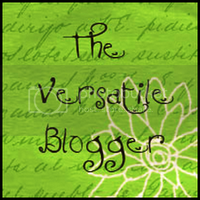 As usual, go visit the original reviews for more photos! 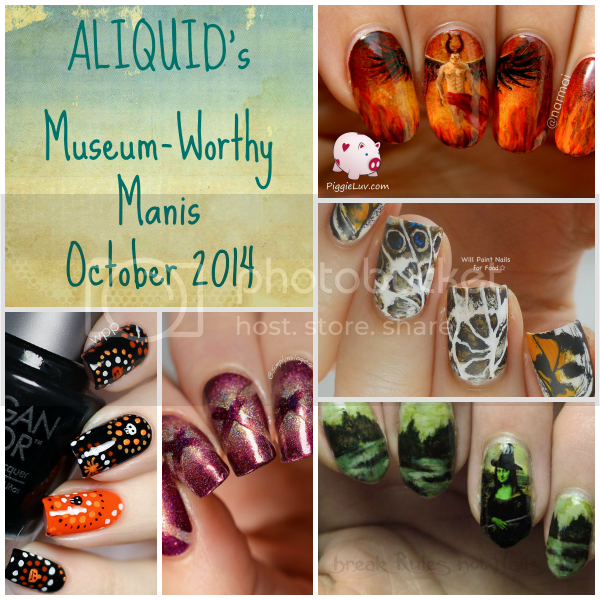 I'll be back tomorrow with my favorite manis from October!